In August of last year I started writing an Ubuntu Touch programming course. Now I am translating it into English. You can see the content of the course (until now) in the next panel of Trello. Do you have any suggestions? I hope to translate one delivery per month although it depends on the free time you have. This really is a great work you are doing! Just want to say 'Thank you!' and ask to finish the whole thing, it will be a great place for any beginner to really get 'hands dirty' with the code! To make it easier to follow the course I will define a fixed date in which I will publish the translation of a chapter. If no unforeseen arise, I will publish a new chapter in the last weekend of each month. The course can be downloaded in ePub, PDF and Mobi formats. If you have any problems with the downloads do not hesitate to comment. Chapter 04 - S01: Introduction to QML language. I would try to translate your English translations into German, if that is possible. I have never worked with GitBook, is there any functionality letting me translate it? I share the document in English in Google Docs. On that document you do the translation. After reviewing the translation, I incorporate it into the course as one more language. This way you work on a text editor and you do not have to know how GitBook works. Yep, sounds great. I can also just translate from the PDF GitBook provides and send you the Google Doc afterwards. It is easier to work on the document because it can be edited. I give you the access details by private. These last two months have been a little chaotic and I have not been able to devote time to the course. If I have no problems, I will publish two chapters at the end of the week. I have to review the text and edit the chapter. I'll let you know when I have it published. I do not know if it will give me time to finish it this weekend. While scanning through it, I see lot's of replicated code in the last example with the Buttons. Isn't there a way to make something like a CalcButton, which has all the common properties (sizes, color) and can be reused. I don't actually know what the syntax for this is (guess why I'm interested in a UT programming course ), but I expect that this is possible and would be a nice rounding up of the chapter. You're right, but the code may still get worse. In a calculator there are buttons that have two or three functions. 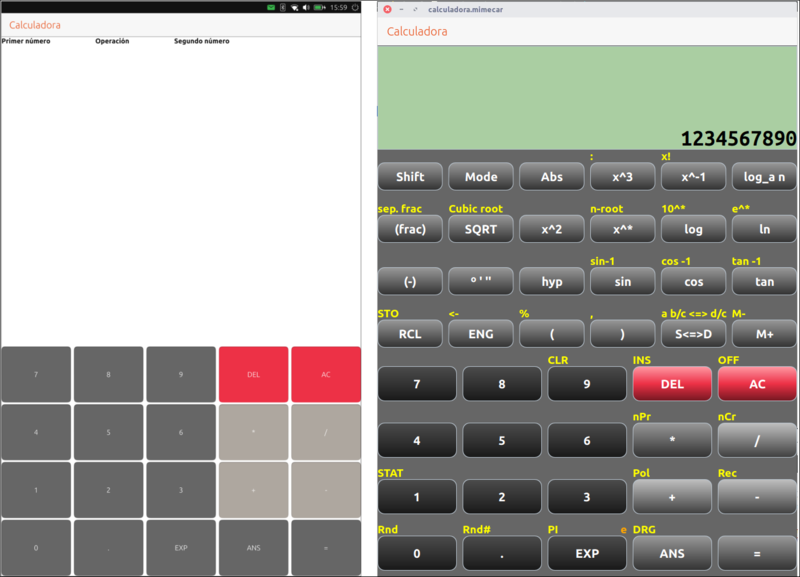 So far you have seen the buttons of the basic calculator but there is also a scientific calculator. In one of the future chapters (it is written in Spanish and I have not yet translated it), a custom component is created that contains the button and the extra functions. You can see an example between the current design and the future. Both versions use QML. Just change the design. If you have any questions related to the chapters that are published do not hesitate to ask. I have follow the instructions to install the SDK. but i can not install the developer kitś. error: No storage pool found. Please create a new storage pool. Why it can not find the pool? Have I forgot something? System is up to date. Ubuntu SDK IDE is installed. Iḿ in the usergroup lxd. Have I to use the Ubuntu Gnome Desktop? It may be a particular Linux Mint bug. This weekend I can create a virtual machine and check if I can replicate the bug. The course I'm programming in Ubuntu 16.04 with the Mate desktop (although it should work with any desktop). At the end of the week I'll be uploading the resources I used at Ubucon Paris 2017. The virtual machine uses Ubuntu Mate 16.04 and has the SDK ready to work. Just download the file, configure VirtualBox and start programming applications. The link to the presentation is temporary, when I publish it I will update the link. I hope at the end of the month to upload the translations of several course sessions. My intention is to match the Spanish and English versions before continuing with the new content. Ubuntu 16.04 with the Mate desktop. SDK already configured with IDE icon on the desktop. The workshop exercises are saved in the User Folder. Links are public. I would ask you to download the resources using the short link because that way I can have some statistics. It is possible, in the future, to add new elements to the virtual machine. It all depends on the suggestions you make. If you have any problems with the file you can indicate it in this thread. I hope to publish new translations of the course next week. When the English and Spanish versions are ready, I will create new content.for both.